After coming home from a long day at work, cleaning your house may not be your top priority. Most people spend a lot of time at work and need to relax and take a break from all responsibilities and chores. We can provide the necessary cleaning and household work which you need done at a day and time which is most convenient to your family. Let us take care of the cleanliness of the rooms in your house or flat and we guarantee you that you will be pleased with the results. Schedule your domestic cleaning, which we provide in Greater London, by using our online form, call centre or e-mail. Our staff of cleaning specialists are fully insured, vetted and trained to do every task properly and without wasting time. 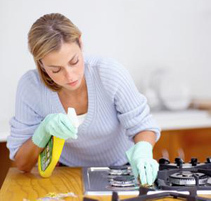 They can provide the necessary household and cleaning work whenever it is convenient to the customer. In our domestic cleaning is included mopping floors, hoovering carpets, dusting all areas, bathroom cleaning, de-greasing kitchens. Our staff will scrub and polish the doors, internal windows, sanitary ware and light fittings. Use our affordable domestic cleaning services which we provide in Greater London during weekdays, weekends and bank holidays. Having many years professional experience and providing our domestic cleaning services for a long time, we know the ins and outs of this work. Our company is at your disposal in Greater London providing reliable domestic cleaning services which can be booked any day of the week.